What is space? And does going 82 kilometres above the Earth meet the definition? "Today, for the first time in history, a crewed spaceship built to carry private, paying passengers reached space." 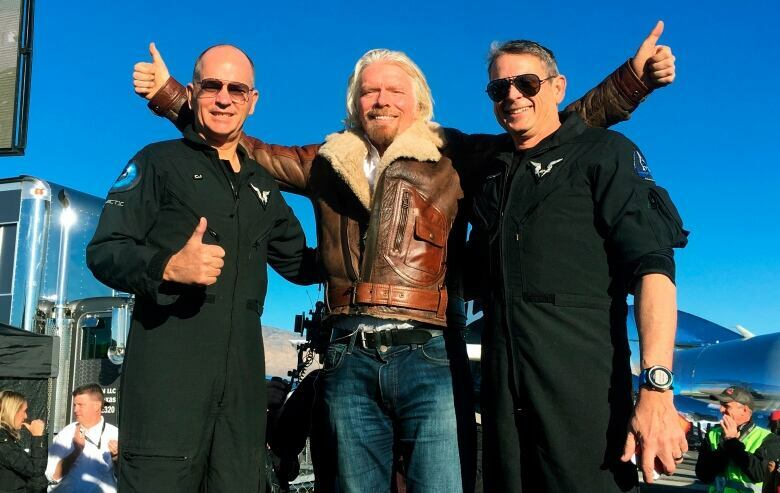 That was the proud tweet posted yesterday by Richard Branson — the billionaire owner of the Virgin Galactic. 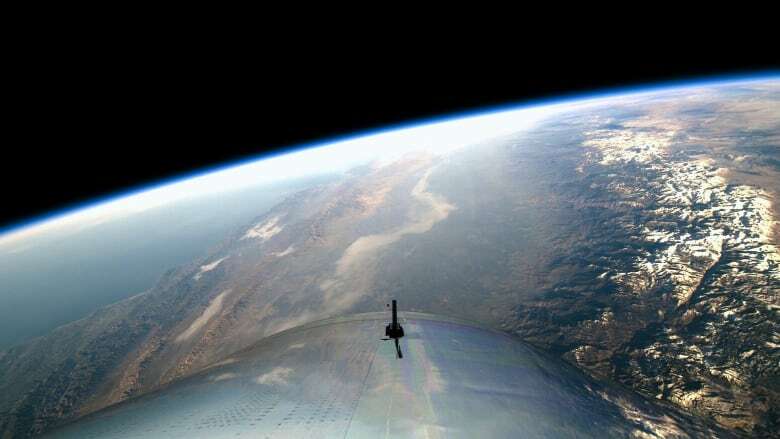 Virgin Galactic's tourism spaceship took off from California's Mojave Desert on Thursday, reaching what the company considers the boundary of space for the first time. The rocket ship hit an altitude of 82 kilometres before beginning its gliding descent, said mission official Enrico Palermo. It landed on a runway minutes later. But that declaration also ignited a fierce debate: what is space? And does jetting 82 kilometres above the Earth meet the bar? Chris Newman is a professor of space law at Northumbria University, and he spoke to As It Happens host Carol off about how space gets defined. Professor Newman, did Virgin Galactic really reach space today? It is all a matter of perspective and it's all a matter of which interpretation of where space begins that you'd want to take. So in one sense, absolutely they did, because there are certain accepted definitions that have space beginning at 50 miles and they went up to 51 miles. However, there is another definition which has space beginning at 62 miles. So you're saying that where space begins is a matter of opinion? Absolutely. It is very much, because there isn't a digital point where we have space all of a sudden. The atmosphere just get progressively thinner and thinner and thinner as we go. So there is a point at which the atmosphere stops providing a lift and we stop getting aeronautical lift for planes and we start relying on centrifugal force. And it's at that point that physicists and astronaut engineers have decided that space is going to begin. All right, but you've probably noticed that a lot of people are jumping in on this news and saying "not so fast" to Virgin Galactic. They say the ship did not reach the magic altitude that's apparently called the Karman line. They did not reach the Karman line. The Karman line is at 100 kilometres, which is 62 miles upwards. The Karman line is an accepted definition of where space begins, but as a space lawyer I can tell you that there's no international treaty and there's no international law which says where space begins. The Karman line is established by the Fédération Aéronautique Internationale (FAI) and, as you say, this is the accepted fact. But now you're telling me that, according to space lawyers, it's an opinion — that scientists may say this is the Karman line and this is where space begins but there's wiggle room? Absolutely, because scientists have now started re-examining where the Karman line begins. There's been a paper recently by Jonathan McDowell, who is a physicist working at the Harvard Smithsonian Institute. And he says that if you look at the data, actually it's much more like 50 miles, where satellites fall into the 50 mile trap and they never get out of it. And there's business interest, isn't there? Because Virgin Galactic is selling seats for wannabe astronauts for hundreds of thousands of dollars per. And if they don't think they're going to space they're not going to pay that money, are they? I think you've absolutely hit the nail on the head here. Whether I think they've gone into space, whether the commentators think they've gone into space, really truly the test is going to be whether paying customers are going to be willing to pay a quarter of a million dollars to go up to 50 miles. The question really is whether the marketplace is going to buy it. Well the marketplace wants the full astronaut experience, right? What do you think would be the full feeling of having been in space? I think you would want weightlessness. I would think you'd want the 'Earth as a ball in your window' effect. And at 50 miles you will absolutely get it. And this is why the area is so disputed, because 50 miles to 62 miles, things do start getting a lot more spacier. But if you can get the full astronaut experience at 82 kilometres or 50 miles, then really why would they need to throttle you deeper into space, at great cost probably? I mean don't they just want to get to the place where people have get their jollies and come home again? I think that's absolutely right. They can sell that experience and it will be a credible space-based experience. They're not going to be astronauts anyway. They're going to be visitors. Astronaut has a whole connotation, certainly in international space law. The term astronaut has a connotation of training, of selection, of task-oriented mission readiness. And that's going to have none of this. If you had a quarter of a million dollars lying around with nothing to do for it, would you buy one of these tickets? Would you sign up for a Virgin flight to space? I'm very terrestrial in my viewpoint. I'm quite happy to look up and I really love watching things like this. And there's nothing that raises the heart beat more than a rocket launch or a trip to space. But I'm very happy on Earth. Written by Donya Ziaee with files from the Associated Press. Interview produced by Chris Harbord. This Q & A has been edited for length and clarity.